JOSEPH Moda is one of Oz Clarke's favourites being a consistant feature in his top 100 wines book which is published each year. 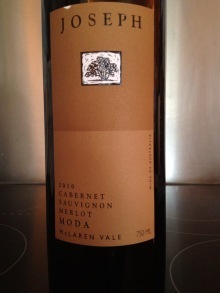 It is recognised as being one of Australia's best Cabernet Sauvignon blends. This McLaren Vale/Clarendon wine is made from 80% Cabernet Sauvignon and 20% Merlot from air dried grapes in the Italian Amarone style by wine makers Joe Grilli and Daniel Zuzolo. The grapes are placed on shaded outdoor racks for two weeks prior to crushing, concentrating the fruit so that it loses around 15% of its weight. According to the company's website "The very small crop in 2010 produced small, intense berries with excellent tannin and acid structure. Above average winter rainfall gave strong, healthy canopies and bud burst came early. Significant hail damage in September and October reduced the crop but a warm dry January and milder autumn produced small, intense berries with excellent tannin and acid structure. The wine was aged in 50% new French and American oak barriques for 20 months." The Joseph Moda can be summarised as intensively and totally unconventional flavoured. There's fruit, tobacco, cinnamon, vanilla on the palate which by all accounts gets better and better if you can face ageing it. At £30 on the expensive side, but the fact that this is so different to a standard Cabernet Sauvignon from McLaren Vale makes this one worth the extra few quid. I bought a few bottles and perhaps a couple will be spared for later consumption, but this one is hard to put down. If you're looking for a unique taste, I agree with Oz, this wine delivers on so many fronts. Highly recommended.